One of Denmark Hill's most famous nineteenth century residents was the Victorian intellectual and reformer John Ruskin, who lived at number 163. Writing about his home there, Ruskin later said, "It stood in command of seven acres of healthy ground... half of it meadow sloping to the sunrise, the rest prudently and pleasantly divided into an upper and lower kitchen garden, a fruitful bit of orchard and chance inlets and outlets of wood walk." Ruskin died in 1900 and by 1904 developers were moving in. A preliminary contract had already been signed to sell off the land for housing when a local resident, Frank Trier, formed a committee to campaign for a public park. He proposed naming the park after Ruskin, to increase publicity and to attract donations from Ruskin's many admirers. It worked and many private donors came forward. Together with contributions from local authorities, including the then boroughs of Lambeth, Camberwell and Southwark, the Ruskin Park committee were able to secure the first 24 acres for £48,000 in January 1906. 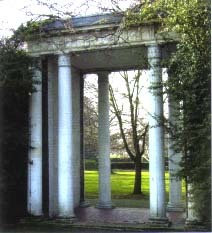 The houses on the site, including Ruskin's former home, were then cleared leaving only the portico from number 170 (which still stands today) and some trees from the large gardens. 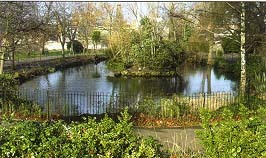 Ruskin Park was designed and laid out by Lt Colonel JJ Sexby, Chief Officer of Parks to the London County Council (LCC). It opened on 2nd February 1907. A further 12 acres were purchased as playing fields in 1909 and opened to the public the following year. Nearby was the newly opened King's College Hospital and during World War I the park became an annexe to the hospital, with huts built in the park to house convalescent soldiers. still stands in the park. John Ruskin (1819-1900), the noted Victorian intellectual and reformer, was a man of many parts: author, artist, art critic, and social reformer. Ruskin was a public figure and widely admired in Victorian England. The son of a wine merchant, Ruskin inherited a considerable fortune, which he spent during his lifetime, largely on charitable and philanthropic projects. He lived for a time at Denmark Hill between Camberwell and Herne Hill on the edge of South-East London, where Ruskin Park stands today. Ruskin Park is notable for its trees: there are over 600 representing over 40 species. The majority were planted when the park was first laid out in the early 1900s. On the eastern side are species from all over the world including a maidenhair tree (Gingko biloba), a rare Caucasian wing nut (Pterocarya fraxinifolia), a sweet gum (Liquidamber styriciflua), a handkerchief tree (Davidia involucrate), a Mississippi swamp cypress (Toxodium distichum) and a large rare eucalyptus. An Indian bean tree (Catalpa bignonioides) is covered in winter with long pods. Historically these were used by native Americans to make flour. The western side of the park is dominated by a fine row of horse-chestnuts (Aesculus hippocastanum), a remnant of the nineteenth-century pleasure grounds which predated the park, and a magnificent turkey-oak (Quercus ceris), believed to be over 200 years old. The park has retained a number of its original Edwardian features, although these are not in good repair. They include a pond and a pergola alongside an overgrown bowling green. As recently as 1987, this green was reported as being beautifully kept and the Friends have been unable to find out when or why the bowling club closed. A fenced-off terracotta stump on the south-eastern edge of the park is the last remnant of a sundial planted to mark Mendelssohn's visit in 1842. The shabby and partly boarded-up portico, supporting an elderly wisteria, is the former porch to 170 Denmark Hill. is one of the original features. 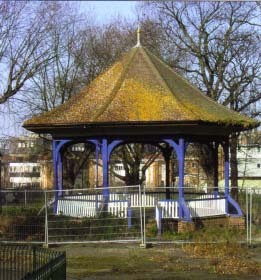 The decorative wooden bandstand in the centre of the park is currently (2006) fenced off, awaiting restoration. It is surrounded by silver maples (Acer Sacchirinum), which like the horse chestnut avenue, are starting to show their age. The Friends of Ruskin Park launched a tree fund some years ago to replace the ageing trees and a number of new plantings can be seen around the park. Today this once elegant small park has a wistful air. Over the last ten years the park has been allowed to fall into a state of neglect with rogue motor bikers, dumped cars and dogs roaming the dog free area. In autumn 2005 the Friends commissioned the Parks Agency to develop a Management plan for the future of the park which has now been handed over. Friends' Chairman Mary Kidd says things are beginning to look up and Lambeth park management are tackling some of the major issues. New toilets are being put in, both for general public use and a children's play area with disabled toilets. 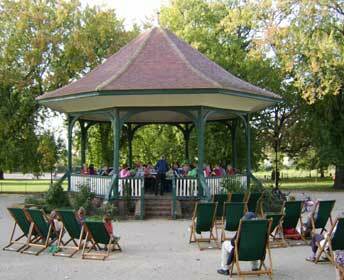 Work is scheduled for the bandstand. The Friends hope this will mark the start of a new era for this pretty but neglected little park. To contact the Friends of Ruskin Park, email them or telephone 020 7274 4472. Since this article first appeared in 2006, not only has the bandstand been repaired and reopened, it is currently hosting weekly band concerts. at Ruskin Park awaiting repairs. The Lambeth Wind Orchestra performs on the reopened bandstand.